A very attractive and well defined exhibit of the Hwaen Pra Pirord (Hwaen Dtakror), in Nuea Rakang Sacred Temple Bell Brass Alchemical alloy, from Luang Por Khwan, of Wat Ban Rai - Circa 2488 BE, the ring of Luang Por Khwan is a very famous Kong Grapan Chadtri Magick Ring of Protection Amulet, with many legends surrounding it. The Hwaen Pra Pirod is a Warrior's and Sorceror's Ring, imbued with Protective Magick and Maha Amnaj Power to Command both Humans and Devas. 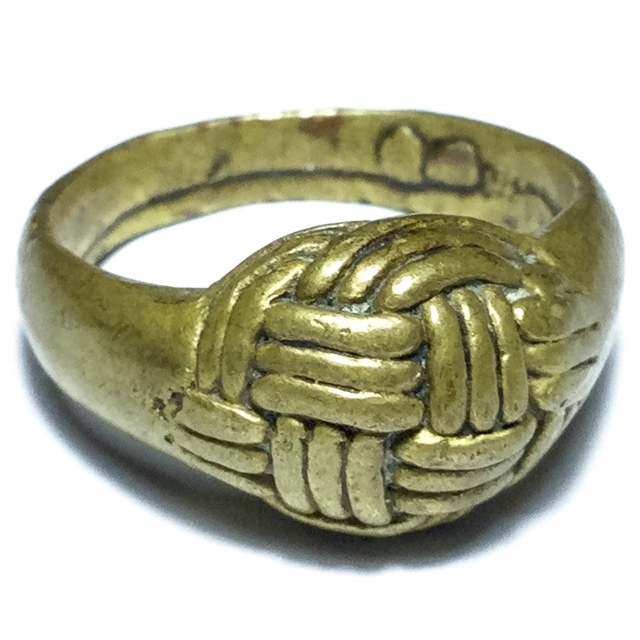 This ring is a 'Tong Luang' sacred Brass version, and is an earlier edition from Circa 2488 BE. Luang Por Khwan was born on 18th September, in 2451 BE in Ban Rai District in the Municipality of Sam Ngam, in Pijit Province. 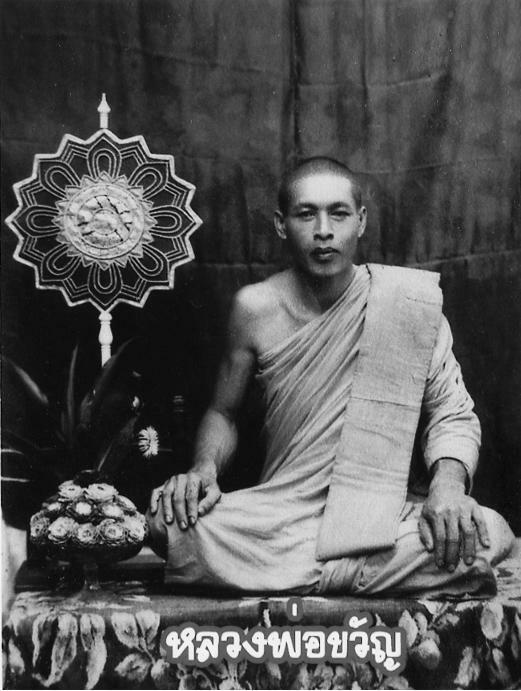 He was Ordained into the Sangha as a Monk in 2470 BE during the fourth lunar waning day phase of the 8th waxing moon. He was a Monk who developed many charitable projects and funded many construction projects for auspicious buildings for the benefit of the local citizens, such as Temples, schools, and hospitals, as well as donating large sums of money to charitable causes. 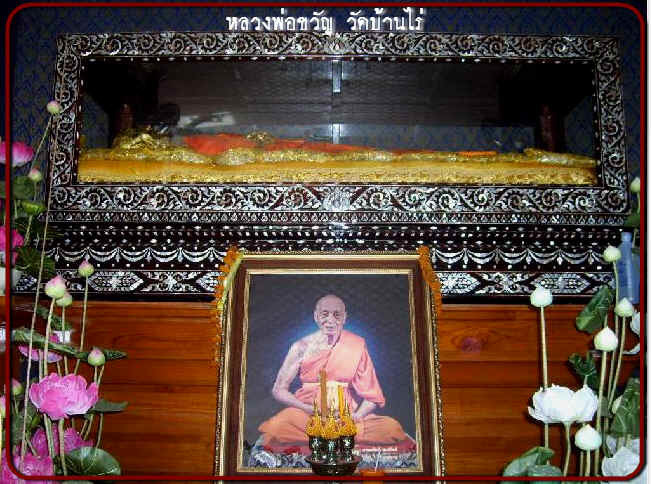 Luang Por Khwan of Wat Ban Rai in Pijit, passed away in 2548 BE, at the old age of 97 years old. There are many tales of miracle events and of his powerful amulets, which have made him and his famous Hwaen Pra Pirod the stuff of Historical Legend. His Patipata was impeccable, and his charitable deeds for the folk of Ban Rai have kept him in the hearts of devotees of the temple to this day, where his remains are in glass coffin for devotees to worship and pay reverence to. The ring measures an inner diameter of 2.2 Cm and will fit on most men's first, ring or middle finger. The ring is often worn on a neckchain either with or without waterproof casing, but some people are lucky to have a finger that fits the ring, as is the case with all rings that are not specially made to measure. This ring will fit fingers of men with medium size fingers, on the small or ring finger. Slim fingered men will possible be able to place it on the middle finger or forefinger. Ladies with larger hands may also be able to use this ring. As already stated, it is difficult to judge by eye. It came to light later that her husband's father had been to the temple to see Luang Por Khwan, and asked him to take the written name and address of the ward and hospital and focus on healing his son. Both the ring saving him from the fall, and Luang Por Khwan's remote healing served to completely save both the man's life, and his physical health.